This is a discounted selection of Dave Draper products. It’s a mix of both digital and physical items, and you can order either or both editions. 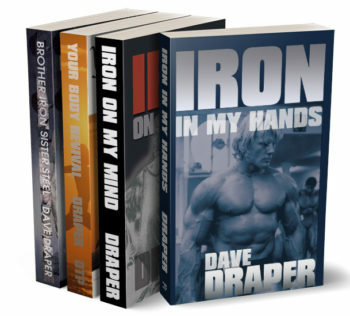 Just when you think you’ve read all there is to read about lifting weights and building muscle, along comes another 80,000 words by Dave Draper echoing in the corners and hallways of the musclehead gym: schemes and routines and hints and tips with the intent to inform, encourage and entertain. Brother Iron, Sister Steel is a private journey into bodybuilding as only Dave Draper can tell it. 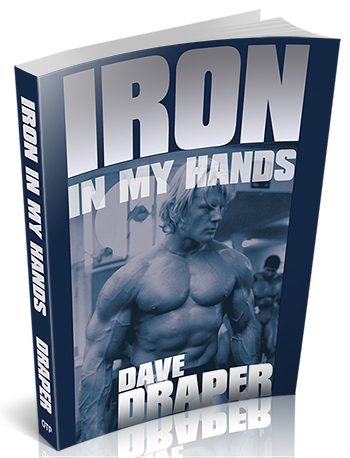 Training techniques, exercise descriptions and nutritional strategies form the book's foundation, but what glues this book together are his personal experiences and insights, humor and candidness, all of which speak to the heart and soul. Your Body Revival is packed with simple, straight-talking encouragement, inspiration and motivation for permanent weight loss. Here Dave provides a commonsense guide to building muscle and fitness -- packed with motivation and enthusiasm. 75 minutes of Bill Pearl and Dave Draper answering a broad range of questions from IronOnline 2005 Bash attendees, and a dozen minutes with Ed Corney as he joins in the conversation for the fun of it. Three cameras captured this one-time event for the history books -- this is a video you'll watch again and again! If you order 3 or more items, a 10% discount will apply. If you order 5 or more, that discount will be increased to 20%. This is a discounted collection of Dave Draper’s products. It’s a mix of both digital and physical items, and you can order either or both editions. You can choose all or some of the elements above.